"Skeletons" redirects here. For the American entertainment unit, see Skeletons (band). For the film, see Skeletons (film). 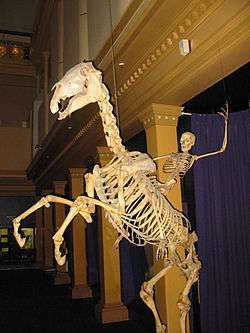 The skeletons of a human and a horse placed in a display in the Australian Museum, Sydney. Vein skeleton of a leaf. Veins contain lignin that make them harder to degrade for microorganisms. The leaf came from Magnolia doltsopa(Magnoliaceae). The skeleton (from Greek σκελετός, skeletós "dried up") is the body part that forms the supporting structure of an organism. There are several different skeletal types: the exoskeleton, which is the stable outer shell of an organism, the endoskeleton, which forms the support structure inside the body, the hydroskeleton, and the cytoskeleton. There are two major types of skeletons: solid and fluid. 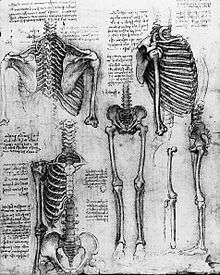 Solid skeletons can be internal, called an endoskeleton, or external, called an exoskeleton, and may be further classified as pliant (elastic/movable) or rigid (hard/non-movable). Fluid skeletons are always internal. Exoskeletons are external, and are found in many invertebrates; they enclose and protect the soft tissues and organs of the body. Some kinds of exoskeletons undergo periodic moulting as the animal grows, as is the case in many arthropods including insects and crustaceans. The exoskeleton of insects is not only a form of protection, but also serves as a surface for muscle attachment, as a watertight protection against drying, and as a sense organ to interact with the environment. The shell of mollusks also performs all of the same functions, except that in most cases it does not contain sense organs. An external skeleton can be quite heavy in relation to the overall mass of an animal, so on land, organisms that have an exoskeleton are mostly relatively small. Somewhat larger aquatic animals can support an exoskeleton because weight is less of a consideration underwater. The southern giant clam, a species of extremely large saltwater clam in the Pacific Ocean, has a shell that is massive in both size and weight. Syrinx aruanus is a species of sea snail with a very large shell. The endoskeleton is the internal support structure of an animal, composed of mineralized tissue and is typical of vertebrates. Endoskeletons vary in complexity from functioning purely for support (as in the case of sponges), to serving as an attachment site for muscles and a mechanism for transmitting muscular forces. A true endoskeleton is derived from mesodermal tissue. Such a skeleton is present in echinoderms and chordates. Pliant skeletons are capable of movement; thus, when stress is applied to the skeletal structure, it deforms and then reverts to its original shape. This skeletal structure is used in some invertebrates, for instance in the hinge of bivalve shells or the mesoglea of cnidarians such as jellyfish. Pliant skeletons are beneficial because only muscle contractions are needed to bend the skeleton; upon muscle relaxation, the skeleton will return to its original shape. Cartilage is one material that a pliant skeleton may be composed of, but most pliant skeletons are formed from a mixture of proteins, polysaccharides, and water. For additional structure or protection, pliant skeletons may be supported by rigid skeletons. Organisms that have pliant skeletons typically live in water, which supports body structure in the absence of a rigid skeleton. The cytoskeleton (gr. kytos = cell) is used to stabilize and preserve the form of the cells. It is a dynamic structure that maintains cell shape, protects the cell, enables cellular motion (using structures such as flagella, cilia and lamellipodia), and plays important roles in both intracellular transport (the movement of vesicles and organelles, for example) and cellular division. A hydrostatic skeleton is a semi-rigid, soft tissue structure filled with liquid under pressure, surrounded by muscles. Longitudinal and circular muscles around their body sectors allow movement by alternate lengthening and contractions along their lengths. A common example of this is earthworm. The endoskeletons of echinoderms and some other soft-bodied invertebrates such as jellyfish and earthworms are also termed hydrostatic; a body cavity the coelom is filled with coelomic fluid and the pressure from this fluid acts together with the surrounding muscles to change the organism's shape and produce movement. The skeleton of sponges consists of microscopic calcareous or silicious spicules. The demosponges include 90% of all species of sponges. Their "skeletons" are made of spicules consisting of fibers of the protein spongin, the mineral silica, or both. Where spicules of silica are present, they have a different shape from those in the otherwise similar glass sponges. The skeleton of the echinoderms, which include, among other things, the starfish, is composed of calcite and a small amount of magnesium oxide. It lies below the epidermis in the mesoderm and is within cell clusters of frame-forming cells. This structure formed is porous and therefore firm and at the same time light. It coalesces into small calcareous ossicles (bony plates), which can grow in all directions and thus can replace the loss of a body part. Connected by joints, the individual skeletal parts can be moved by the muscles. 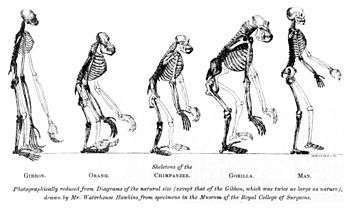 Pithecometra: From Thomas Huxley's 1863 Evidence as to Man's Place in Nature, the compared skeletons of apes to humans. In most vertebrates, the main skeletal component is referred to as bone. Another important component is cartilage which in mammals is found mainly in the joint areas. In other animals, such as the cartilaginous fishes, which include the sharks, the skeleton is composed entirely of cartilage. The segmental pattern of the skeleton is present in all vertebrates (mammals, birds, fish, reptiles and amphibians) with basic units being repeated. This segmental pattern is particularly evident in the vertebral column and the ribcage. Bones in addition to supporting the body also serve, at the cellular level, as calcium and phosphate storage. The skeleton, which forms the support structure inside the fish is either made of cartilage as in the (Chondrichthyes), or bones as in the (Osteichthyes). The main skeletal element is the vertebral column, composed of articulating vertebrae which are lightweight yet strong. The ribs attach to the spine and there are no limbs or limb girdles. They are supported only by the muscles. The main external features of the fish, the fins, are composed of either bony or soft spines called rays, which with the exception of the caudal fin (tail fin), have no direct connection with the spine. They are supported by the muscles which compose the main part of the trunk. The bird skeleton is highly adapted for flight. It is extremely lightweight, yet still strong enough to withstand the stresses of taking off, flying, and landing. One key adaptation is the fusing of bones into single ossifications, such as the pygostyle. Because of this, birds usually have a smaller number of bones than other terrestrial vertebrates. Birds also lack teeth or even a true jaw, instead having evolved a beak, which is far more lightweight. The beaks of many baby birds have a projection called an egg tooth, which facilitates their exit from the amniotic egg. To facilitate the movement of marine mammals in water, the hind legs were either lost altogether, as in the whales and manatees, or united in a single tail fin as in the pinnipeds (seals). In the whale, the cervical vertebrae are typically fused, an adaptation trading flexibility for stability during swimming. The human skeleton consists of both fused and individual bones supported and supplemented by ligaments, tendons, muscles and cartilage. It serves as a scaffold which supports organs, anchors muscles, and protects organs such as the brain, lungs, heart and spinal cord. Although the teeth do not consist of tissue commonly found in bones, the teeth are usually considered as members of the skeletal system. The biggest bone in the body is the femur in the upper leg, and the smallest is the stapes bone in the middle ear. In an adult, the skeleton comprises around 14% of the total body weight, and half of this weight is water. Fused bones include those of the pelvis and the cranium. Not all bones are interconnected directly: There are three bones in each middle ear called the ossicles that articulate only with each other. The hyoid bone, which is located in the neck and serves as the point of attachment for the tongue, does not articulate with any other bones in the body, being supported by muscles and ligaments. There are 206 bones in the adult human skeleton, although this number depends on whether the pelvic bones (the hip bones on each side) are counted as one or three bones on each side (ilium, ischium, and pubis), whether the coccyx or tail bone is counted as one or four separate bones, and does not count the variable wormian bones between skull sutures. Similarly, the sacrum is usually counted as a single bone, rather than five fused vertebrae. There is also a variable number of small sesamoid bones, commonly found in tendons. The patella or kneecap on each side is an example of a larger sesamoid bone. The patellae are counted in the total, as they are constant. The number of bones varies between individuals and with age - newborn babies have over 270 bones some of which fuse together. These bones are organized into a longitudinal axis, the axial skeleton, to which the appendicular skeleton is attached. The human skeleton takes 20 years before it is fully developed. 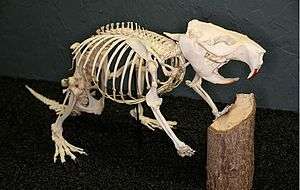 In many animals, the skeleton bones contain marrow, which produces blood cells. There exist several general differences between the male and female skeletons. The male skeleton, for example, is generally larger and heavier than the female skeleton. In the female skeleton, the bones of the skull are generally less angular. The female skeleton also has wider and shorter breastbone and slimmer wrists. There exist significant differences between the male and female pelvis which are related to the female's pregnancy and childbirth capabilities. The female pelvis is wider and shallower than the male pelvis. Female pelvises also have an enlarged pelvic outlet and a wider and more circular pelvic inlet. The angle between the pubic bones is known to be sharper in males, which results in a more circular, narrower, and near heart-shaped pelvis. Bones are rigid organs that form part of the endoskeleton of vertebrates. They function to move, support, and protect the various organs of the body, produce red and white blood cells and store minerals. Bone tissue is a type of dense connective tissue. Bones have a variety of shapes with a complex internal and external structure they are also lightweight, yet strong and hard. One of the types of tissue that makes up bone tissue is mineralized tissue and this gives it rigidity and a honeycomb-like three-dimensional internal structure. Other types of tissue found in bones include marrow, endosteum and periosteum, nerves, blood vessels and cartilage. There are 206 bones in the adult human body and 270 in an infant. During embryogenesis the precursor to bone development is cartilage. Much of this substance is then replaced by bone during the second and third trimester, after the flesh such as muscle has formed around it; forming the skeleton. Cartilage is a stiff and inflexible connective tissue found in many areas in the bodies of humans and other animals, including the joints between bones, the rib cage, the ear, the nose, the elbow, the knee, the ankle, the bronchial tubes and the intervertebral discs. It is not as hard and rigid as bone but is stiffer and less flexible than muscle. Cartilage is composed of specialized cells called chondrocytes that produce a large amount of extracellular matrix composed of Type II collagen (except Fibrocartilage which also contains type I collagen) fibers, abundant ground substance rich in proteoglycan, and elastin fibers. Cartilage is classified in three types, elastic cartilage, hyaline cartilage and fibrocartilage, which differ in the relative amounts of these three main components. Unlike other connective tissues, cartilage does not contain blood vessels. The chondrocytes are supplied by diffusion, helped by the pumping action generated by compression of the articular cartilage or flexion of the elastic cartilage. Thus, compared to other connective tissues, cartilage grows and repairs more slowly. In Western culture, the skeleton is oftentimes seen as a fearful symbol of death and the paranormal. It is a popular motif in the holiday Halloween, as well as Day of the Dead. Wikimedia Commons has media related to Skeletal system. 1 2 Barnes, Edward E.; Fox, Richard S.; Barnes, Robert D. (2003). Invertebrate zoology : a functional evolutionary approach (7. ed.). Belmont, Calif. [u.a. ]: Thomson, Brooks/Cole. ISBN 0-03-025982-7. ↑ Pechenik, Jan A. (2015). Biology of the Invertebrates (Seventh ed.). New York: McGraw-Hill Education. ISBN 978-0-07-352418-4. ↑ Barnes, Robert D. (1982). Invertebrate Zoology. Philadelphia, PA: Holt-Saunders International. pp. 105–106. ISBN 0-03-056747-5. ↑ "Beluga Whale". Yellowmagpie.com. 2012-06-27. Retrieved 2013-08-12. ↑ "About Whales". Whalesalive.org.au. 2009-06-26. Retrieved 2013-08-12. ↑ William W. Reynolds & William J. Karlotski (1977). "The Allometric Relationship of Skeleton Weight to Body Weight in Teleost Fishes: A Preliminary Comparison with Birds and Mammals". Copeia: 160–163. doi:10.2307/1443520. ↑ Miller, Larry (2007-12-09). "We're Born With 270 Bones. As Adults We Have 206". Ground Report. ↑ "How many bones does the human body contain?". Ask.yahoo.com. 2001-08-08. Retrieved 2010-03-04. ↑ Tözeren, Aydın (2000). Human Body Dynamics: Classical Mechanics and Human Movement. Springer. pp. 6–10. ISBN 0-387-98801-7. ↑ Balaban, Naomi (2008). The Handy Anatomy Answer Book. Visible Ink Press. p. 61. ISBN 978-1-57859-190-9. ↑ Stein, Lisa (2007). Body The Complete Human: How It Grows, How It Works, And How to Keep It Healthy And Strong. National Geographic Society. p. 73. ISBN 978-1-4262-0128-8. ↑ Steele, D. Gentry; Claud A. Bramblett (1988). The Anatomy and Biology of the Human Skeleton. Texas A&M University Press. p. 4. ISBN 0-89096-300-2. ↑ Schmiedeler, Edgar; Mary Rosa McDonough (1934). Parent and Child: An Introductory Study of Parent Education. D. Appleton-Century. p. 31.